In the first Australian study of its kind, James Cook University medical school researchers have found doctors trained at JCU are much more likely than doctors trained elsewhere to practise in regional centres and the bush. While only around 20 percent of graduates from large city medical schools worked outside metropolitan areas, JCU found that 60 percent of its graduates had opted for life in more remote places. A unique study led by JCU’s Professor Tarun Sen Gupta used data showing where medical school graduates from 2005 to 2011 were actually practising, rather than where they said they would like to practise. He said the result was no accident, with JCU’s Townsville medical school favouring recruits from outside the big cities, and its training conducted in rural and regional locations with a focus on rural health. “The cases taught are from rural circumstances, and the teachers themselves have rural backgrounds and provide positive role models,” Professor Sen Gupta said. The idea was that this kind of exposure would pay off, with more medical school graduates taking the option of working in more remote areas where they are needed most. But it’s only now that there’s been hard data to support the theory. Professor Sen Gupta said nearly half of all rural and regional doctors in Queensland are overseas trained. Professor Sen Gupta said the study showed that the JCU programme was a success and showed a need for a continued investment and emphasis on training doctors in regional settings. He said if the trend continued, Australia would see significant improvements in its remote healthcare workforce over the next decade. *JCU’s Townsville-based medical school graduated its first 58 doctors in 2005. *Around 160 are expected to graduate this year and around 190 next year. *The school has produced around 920 doctors in its 15 years of existence. An interview is available with Dr Kaylene Girgenti, a recent graduate who is now in Townsville but has worked in rural areas. 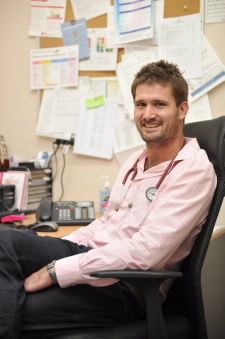 An interview is also available with Dr Sam Goodwin, who graduated from JCU’s Townsville medical school in 2006 and is now the Deputy Director of Medical and Clinical Health Services in Alice Springs. Please also find attached a link to a piece on Dr Goodwin published internally at JCU.